In this era of livestreaming runway shows, Twitter ticket giveaways, and Facebook-enabled model casting, a visit to the Balenciaga Exhibit at the Queen Sofia Spanish Institute is like entering a glamorous time capsule. Vogue editor Hamish Bowles selected more than seventy pieces of Cristobal Balenciaga’s seminal designs from 1937-1968, and emphasized that although Balenciaga worked in Paris, the designer’s Spanish heritage – both personal and historical – is present in all of his work. “Black was the color of Balenciaga’s childhood,” declares a card in one of the exhibit’s three galleries. The designer’s father died when he was very young, surrounding the boy with mourning female family members, always dressed in black. For this reason, each of his 93 collections contained one black dress, entirely cut and sewn by the designer himself. The Catholic tradition and discipline is present throughout Balenciaga’s work. The wedding dress pictured at top, designed for the daughter of a Spanish marquesa, shows his “infanta” silhouette: a nipped waist and full convex skirt echoing the Spanish court attire Diego Velázquez painted 300 years earlier. Balenciaga’s art-world contemporaries influenced him as well. Bowles coupled Balenciaga’s bright, minimalist frocks alongside a Cubist picture by painter Joan Miró, who later illustrated the cover of one of the designer’s lookbooks. 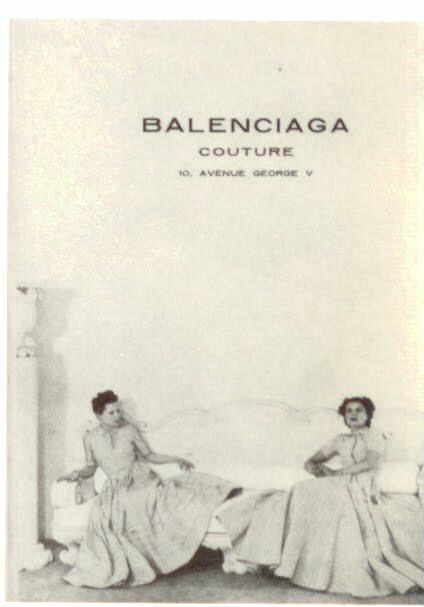 This early example of designer-artist collaboration surprised us, but not as much as the blown-up reproduction of a 1938 ad for Balenciaga’s Paris couture house. The stark angular typeface, full-blast lighting, and blasé look in models’ eyes bears startling resemblance to Marc Jacobs' advertisements shot by Juergen Teller. Our favorite part of the exhibit was the bottom floor, where flamenco music piped past Balenciaga’s linen fishermen’s tunics and bright navy bonnets, boleros with swinging pampilles, and polka-dotted gowns with ruffled layers that looked as if they could twirl away. This was the Spain of fishermen, bullfighters, and gypsies. With Fashion Week around the corner, this room reminded us that a great designer can combine personal history, cultural context, and a tremendous amount of discipline to create nothing short of magic.